Invicta’s Wall of Merit is a list of those whom have distinguished themselves in service to the project. Whether on the field of battle or off, the wall of merit is a listing of the greatest of the great. Honourees to the Wall of Merit receive one of the following medals. The Medal of Fire: Awarded for exceptional aggression and skill on the field of battle. The Medal of Fire is awarded to those who show great skill at taking the fire in their souls, and channelling it at our enemies. Lord Agoris Korsakov was born into priviledge among the elite in Divinities Reach. Unsatisfied with his life as a noble waiting to inherit his wealth he took over his father's company, the Invicta Trade Company, expanding its services to include Mercenary work as well as overseas trade and providing supplies to outposts in need. The Queen has thus looked the other way for some minor infractions when making deals to support the kingdom. With the company recently restuctured to support it's new trade of mercenaries for hire, Agoris now holds the title of Captain. He and his second in command Cognut are now looking to fill the ranks of the new ITC. Once they started the fire, that set all the other events in motion. The fire quickly spread from the outbuildings to the stable, as fires are wont to do, when set in an area of timber and thatch buildings that had been drying for many seasons. Once the thatch on the stable roof caught, the horses started screaming in panic. The two steady old plow horses and the grey mare that was used for riding by the smith that called the stedding home, all were voicing their terror at the top of their lungs. The young girl, started to rise from her hiding spot at the edge of the tree line. Her blue eyes were huge with tears, seeing the devastation of her home, and she just couldn't let the horses die too. Her brother reached for her but he was too late. The small, golden haired form darted for the burning stable. ((better late than never, eh? Y'all earned it! Come celebrate at The Krayt's Nest with Tatooine Frontier Music, Booze, Spice, gambling , dancers, Escorts and other sins. 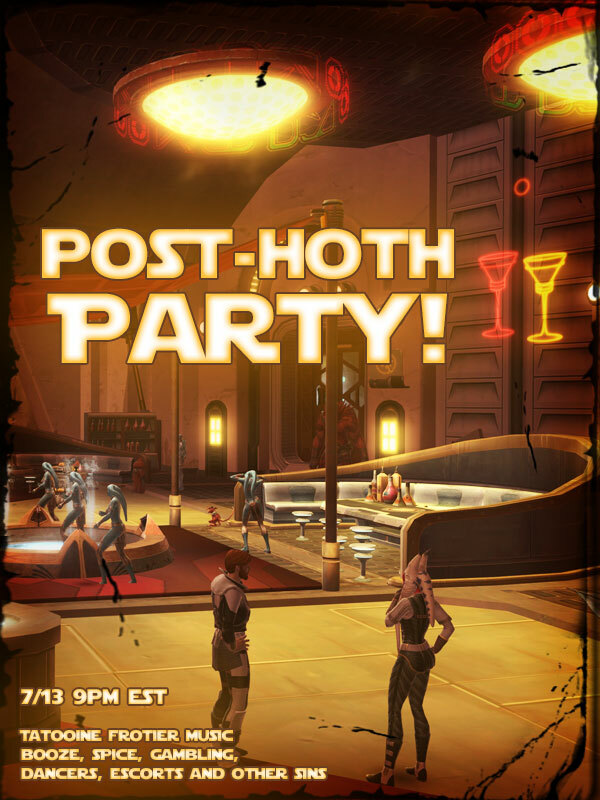 Read more about Post-Hoth Party! Every Thirsday the Merc Crew will gather on the ISS Imvicta to discuss ongoing and upcoming jobs. This Thirsday will be the first meeting of that kind so we'll have an IC Par then an OOC part caus I;ll need your input on how we'll do things. Recently Keeper Jar’rogen was captured by Zakuul forces, given the extremely sensitive nature of the information he possesses it is imperative that we recover him before he breaks under interrogation. All available personnel that can assist contact Darth Belatrix for assignment as quickly as possible. Zakuul personnel enlisted the aid of several Nar Shaddaa gangs to assist with capturing Keeper Jar’rogen, he was last seen being loaded, unconscious, aboard a ship with Skytrooper droids. Out in a meaningless system of a useless sector floats a nameless, uninhabited lump of rock. Assorted debris orbit it, too small to be moons, too many for anyone to notice one more. Among the irregular rocks rests a ship, its transponder codes deliberately mangled, exterior markings so marred by scavenging as to be unrecognizable. The few patches of crimson outer hull left are too damaged to be useful to any but the most desperate. Engine casings, modified to accommodate larger and more powerful drives, sit empty. Wires drift in non-existant breezes. Most of the transparisteel viewports are cracked and broken - some from the outside, but alarmingly, most blown out from the inside. It holds no escape pods. It carries no weaponry. Hello this is an invite from your neighbor in Invicta to all the troublemakers of the casino! Yes Troublemakers. I am known as Doctor Raci and I have come up with an awesome way to let off some steam with all the fighting and death we do behind the scenes. What must you do to be apart of the event? That's simple... look around your area (Your guild) for a special someone to be your partner as each team must have two members to compete. That's what we will focus on in week one. Establishing teams and setting up the first match. Then the following match it is up to each of the four people ((on both teams of the match.)) to fight and establish the winner within the ONE WEEK. Members of Invicta will be doing the same thing as this is opened to both under Darth Belatrix and Xilyia the magnificent. Read more about Teon and his toys. Information had been uncovered to the discovery of a prior member to Project Invicta.. Thursday 7/14/16 8:30pm start time, there will be a event to find more information on where this doctor might be.. The event will start on the ISS INVICTA. Thank you..